Competitive Gaming Community for the Benelux! If you are looking for a professional group to play games with? Just check out the LowLandLions Community. We play several online multiplayer games and everybody can join. I am going to be in the Groupchat of this steam group every evening to be of assistance when needed. I think if more peeps can join in we can use this as a main communication tool for people. Looking for a scrim/gather / trial for a team / wanting to play a new game (such as rocket league or ARK) and want to invite Lions to join.. etc etc. The chat can also be used to just chitchat ofcourse but maybe this can be annoying when ingame..
*This only will be useful if more people join the chat. Heyyy, zoek een team waar ik wat mee kan spelen. Mijn rank is momenteel MGE, wil graag wat verder komen :). add me maar op steam! Ik ben op zoek naar LEM/Supreme players om mee te spelen, voeg me toe als je zin hebt in wat comp games. Hi da real mvp. 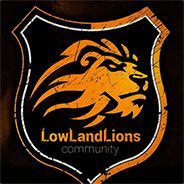 Register on our website lowlandlions.com , connect to our teamspeak: ts.lowlandlions.com and join one of the channels. Hey, just joined the group. Experienced FPS'er, 1.6 semi-competitive and Quake Live high 1v1er. Currently main sniper and Fragger. If anyone wanna team up in comp let me know, I'm tired of people playing TDM style.